Hand Balancer Natalie, combines the art of hand-balancing & dance with unique ease. Watching her hand balancing acts you can enjoy a slick and dynamic series of movements around a handstand table leading to a stunning variety of highly skilled one-arm handstands. The clear and beautiful visual imagery of hand balancing creates a soft and magical atmosphere. Natalie can perform in a variety of costumes, including extravagant dresses, a bumblebee costume and patterned unitards. Minimum space requirements for this act are 2.5m x 2.5m x 2.5m, although smaller spaces can be adjusted to. An acrobatic theatre act about a cheerful and quirky bumblebee, that speeds across the stage in search of pollen. Breathtaking hand balancing sequences go hand in hand with hilarious comedy. It is a fast-paced entertainment and a guaranteed highlight. 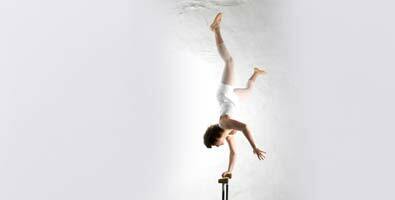 Polar is an impactful and dramatic dance piece including hand balancing. A story of moving shadows and lingering conflicts gives the audience goosebumps as they anticipate the serene beauty of past memories to overcome the creepy creatures that arise with them. A heavenly hand balancing act. 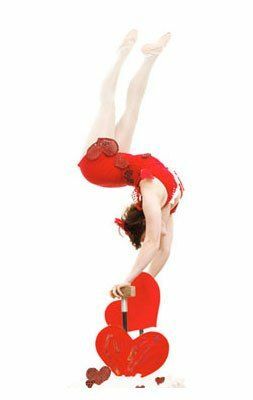 A special gift for this years Valentine’s Day is the dynamic and funny walkabout act that combines athletic and graceful acrobatic balancing with joyful, light heard theatre. A treat for every event! This hand balancing act is also available as a stage act. Natalie is an excellent hand-balancer. She was a pleasure to work with. We have never seen anything so breathtaking.